My backyard really needs some tlc. Right now one side of it is very uneven as there use to be 2 trees that I had removed. I wanted to do the entire backyard into a deck but I don’t have the money. I’m looking for some suggestions on what I could do that’s going make my backyard usable but also affordable. Next story Serious Talks with your Kids. pallets laid down to make a deck ? Alexis Musik that looks so beautiful and relaxing! You can get free much at sherwood park ecocenter …and for those of you reading that need lots of mulch..use the chip drop app and request no spruce or pine . An arborist truck will dump some (be prepared for a LARGE load unless you specify smaller..some companies have smaller trucks than others). Your yard looks quite small and heavily shaded. If you want a deck put one on that can be expanded when you can afford an addition. You need special sod that grows in shade too and shade plants too. A vegetable garden would not do well in this level of shade. Sheldon L McGuey thank you!! Do you mind me asking how much it was?! Sheldon L McGuey thank you so much!! My backyard is about the same size and at one point, made me cry when I opened the back door. I got it levelled out and some interlocking bricks. Got some decent patio furniture, outdoor rug,gas fire pit table, and some big planters for flowers. It costs but all my neighbours are jealous. Breaking the yard up in pieces makes it very choppy. 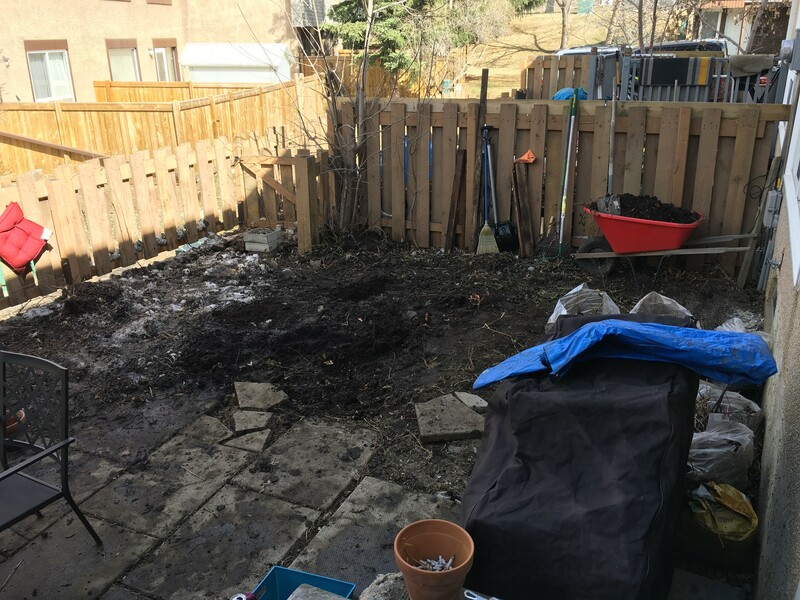 You can get free dirt on kijiji. Hailey Villäin thank you so much! I would first clear out all the debris from your yard, then go to Home Depot and rent one of those drums that makes the ground leveled. Then use pallets (there are places that gives them out for free, and fill in the wider gaps with wood from other pallets, then stain the wood. Depending on your level of craftsmanship, you should have a pretty good DIY deck. Victor Eff love this. ?going to give it a try…thanks! You’re welcome – it’s somewhat labour intensive (i.e. flattening the yard, getting the pallets, working the pallets, and staining), but it’s one of the more affordable ways of sprucing up the back yard. Kristyn Sheppard The drum thing is important because you want your deck to be nice and flat when you walk on it and not cause a tripping hazard. If you can’t get rid of all the protruding tree roots, maybe cover over them with a layer of sod before you start leveling the yard to put up the deck.